concordo con gli altri,sono veramente SPETTACOLARI!!!!! (li voglio! ).peccato solo per il numero di soldatini. Condivido i commenti dei miei predecessori. Ottimo set di figure con dettagli mai visti in 1/72!! 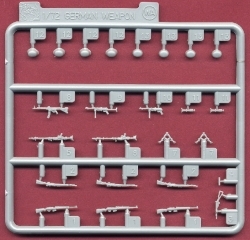 Ottimo lo sprue con armi ed equipaggiamento. La Dragon ha veramente prodotto qualcosa di alta qualità.....speriamo ora che non si limitino soltanto a questi 2 set. Come già riportato nel forum di SoL questa scatola è a dir poco fantastica. L'accuratezza nella riproduzione dei visi, degli equipaggiamenti e delle armi nè fanno un set unico nel panorama modellistico internazionale. Convengo con il collega cordonblue questo set ha messo su un angolo le precedenti scatole di paracadutisti tedeschi, il paragone con altre produzioni non regge se non nel numero di soggetti. Spero che Dragon prenda per mano al più presto altri soggetti non tedeschi. Extraordinary and unprecedented quality in Braille Scale. 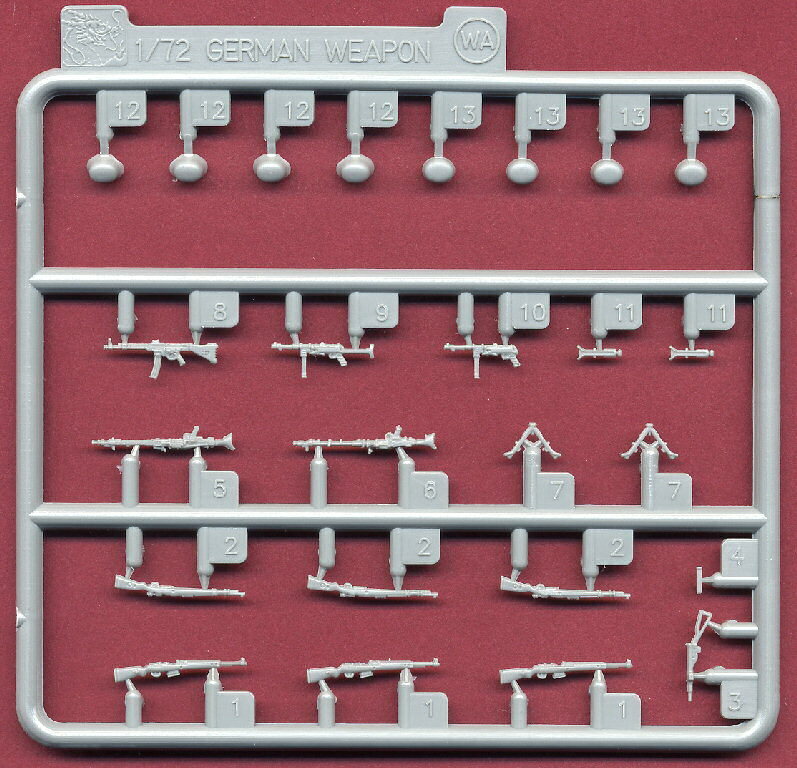 There are plenty of very good German infantry or German units in 1/72. Maybe too many. But, there are 2 very respected units from WW2 which still today fascinate imaginations. DAK and Fallschirmjagers. Yet extraordinarily enough, there have been no good sets at all of the famous Green Devils of Monte Cassino in 1/72. Until today. Those are 8 fully detailed Fallschirmjagers in vivid poses with heads, facial expressions and clothing details carefully sculpted. The addition of extra heads and helmets really gives you the option of having 8 entirely different soldiers based on the 4 basic poses, legs can be moved, arms exchanged... The quality is way above the Presier quality, that was so far the quality standard in 1/72 scale, they pushed the detail so much that one of the soldier is holding a cloth in his hand and another one of them is smoking a cigarette. I'm telling you, you have to see it to believe it. Also, an amazing array of weapons including Kar98k, G43, MP40, MP44 and MG42 all reproduced with exquisite detail in such small scale. Even the magazines, binoculars and bipods are separate. 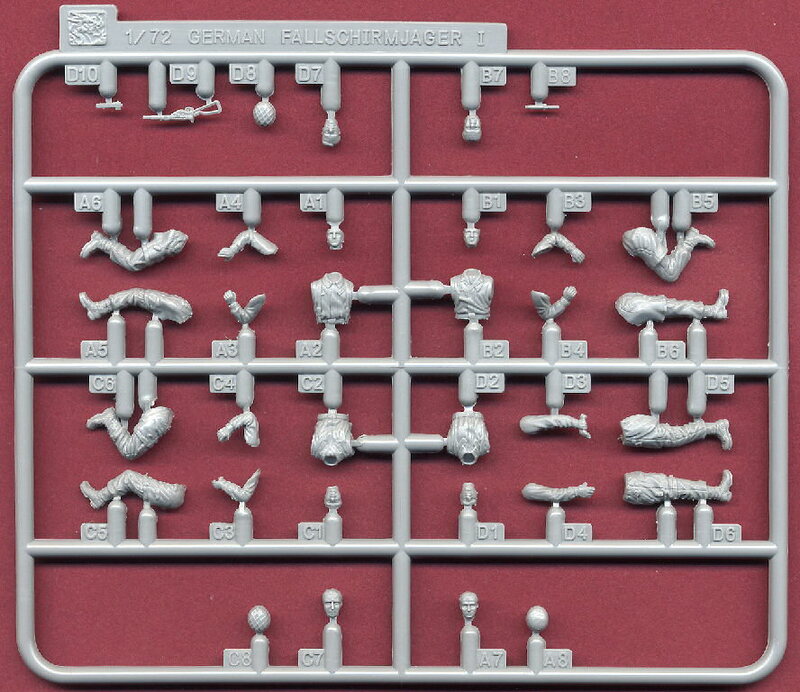 There are 2 sets of sprues, giving plenty of weapons, equipments and accessories for at least 20 figures. 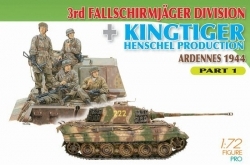 Another great find is the standard equipment including water bottles, canteens and pistol pouches realistically reproduced, and there is plenty to add to other figures in your scratch box. These newly tooled figures are quite simply the best ever to be released on the market. They feature well-engineered part separation, and they fit together with great ease (and they are sandable!). Figure modelers have been waiting for decades for figures of this degree of detail and sophistication! Likewise, their weapons and personal equipment are astoundingly accurate and well detailed. Poses are natural and anatomically correct. There are no concerns over undercut detail being missed as always happens with 1/72 soft-plastic figures. And there is no unsightly flash or so little it can easily be sanded down or cut away with ease. These figures are made with Dragon's hard-plastic formula, so any super glue or standard cement works. This release starts a whole new era in 1/72 scale plastic figures. As I said, you have to see it to believe it. As for the inclusion of a beautiful Kingtiger kit in the box? Well, that's just a bonus! And there is another set (part 2) coming up in april 08, that has 8 new figures in new poses!